Boleh La bowlers (from left) Abdul Khadir Haziq, Angelo Koay and Simon Ong posing with Tay Motors’ (from right) Nur Hazirah Ramli, Robert Lu and Ang Kean Joo before their Positioning Round match. KUCHING: As expected, the Tay Motors Trios League 189 & Below at Megalanes Sarawak, Batu Kawa provided a nail-biting finale with Lucky emerging as the champion. Comprising Galliano Edward, Datin Rakiah and Edward Juit, Lucky edged Frenz 10.5-9.5 in the Positioning Round match. Defending champions Tay Motors’ Nur Hazirah Ramli, Robert Lu and Ang Kean Joo leapfrogged into second place with a 13-7 win over Boleh La, while Frenz settled for third after losing to Lucky. Dynamic-X, Bulan Mengambang, 1 Team Blacklist, Tidal Bore and PBA-1 completed the league standings in fifth to 10th positions respectively. Lucky grabbed further honours when they won the Team High Game with 666 pins, beating Frenz into second place by 10 pins. 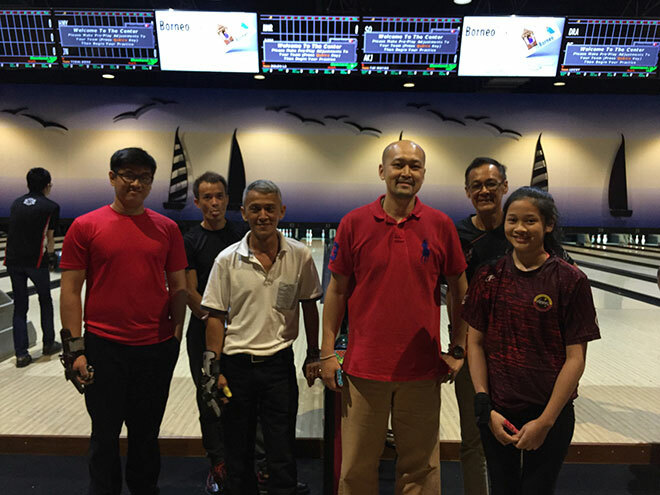 Boleh La, comprising Abdul Khadir Haziq, Angelo Koay and Simon Ong, also walked away with the Team High Series with their total of 2,436 pins and Frenz were second with 2,426 pins. Muhd Mashruhin Mashan of Dynamic-X grabbed the Individual High Game award with 275 pins while Alfariq Mohd Gadaffi of PBA-1 and Dayang Aida Natasha of Frenz shared the second placing with their scores of 270 pins. Dayang Aida held on to finish first in the Individual Hig Series with 890 pins while Yean Chia Ming of Triple-X was second on 877 pins. The prize presentation and the Mini-Masters will be held this Sunday (Oct 29).